When I read about Kimberlycun‘s Gisele Bundchen Ipanema sandals and how comfortable they were, I knew I had to check them out as my current pair of sandals are on the brink of giving up. Unfortunately, I did not have time to look at them locally, so during my weekend in Singapore, I went to track them down. I finally found them at a Royal Sporting House store (also sold at Royal Sporting House in Malaysia) but they were out of my size in the sandals. I did try on the flip flops which were very comfortable. 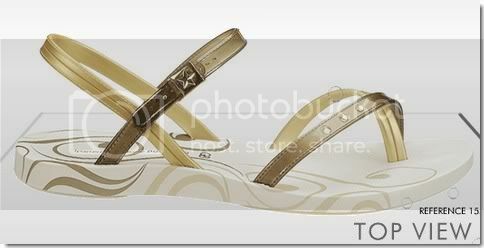 The Gisele Bundchen line of flip flops and sandals is of course, inspired by the model of the same name. The sandals and flip flops are really soft and comfy on the feet. The foot bed was soft and flexible which I can expect would make for a good walking experience. And you know what? I’d probably do the same. Bata flip flops aren’t as pretty on the feet but the prices are. That said, the Gisele Bundchen Ipanema sandals were sold out all over Singapore and the ones I did find were too small or too big for me. PREVIOUS POST: I don’t need these items! NEXT POST: Nars Cosmetics in Malaysia? I caved in. HELP! I really did. I tried not to, I tried walking out, but the shoes called me back in. Tine: OMG! Now I really have to stay far far away from them LOL… AUD40 is damn siong man! i like these! but i like croc shoes more! honestly, croc (not the big headed ones) are much better than these. i find crocs have more cushion. spongy? my easily cracked feet thank croc. I saw them at RSH before The Star mentioned them… the pair I had my eye on were RM49.90 – NO WAY I was gonna spend that much on basically flip flops… unless they were on sale, haha. Those look gorgeous-they so don’t look like flip flops to me…(justifying to self). I think it’s all hyped up =) I’d rather get a pair of Teva. Good during rain good for walking and well, it’s super super long lasting but of course, it’s simplelah. Heh. I tested my Birkies to its max already and I’m proud to say that I have not regretted buying it albeit being a whopping 200 bucks. It didn’t fail me in the rain, I can walk for hours in it without feeling a single tinge of pain AND most importantly, I recently injured my ankle real bad and couldn’t walk on normal slippers except Birkenstock’s. It practically absorbed the shock you get from walking on hard ground and helped me move around without worrying I would strain my ligaments further. The support it gave to my ankle was great and it’s even endorsed by podiatrists. I don’t think any sandals out there can match up to Birkies. Heh. It’s worth the investment and if you want style, get the bling bling ones. I wear that on my dinner outing sometimes. I foresee these sandals lasting me till I’m become a mummy. Haha. S-Kay: Ah! I just tested Birkenstocks and I think I must have them! They hold my feet so well even if they look really bulky on my feet! Thanks for the review. You’re making me want to go look at them again! I’m a big fan of these sandals. Already have 3 and still looking to add more. You can also get them at Novo which probably carries a wider range of designs. it is indeed very very comfy n cute, n i wear it everywhr i go.. to classes, to shopping malls… basically anywhr… n never it has failed me. I got mine at Novo too. Yeah AUD39.90 is nuts. Yet, I want another pair! :O I finally tried it out when I was out in town just now, and it was like I wasn’t wearing anything on my feet at all. PS: S-Kay, I saw the latest Birkies when I was in the city just now. OMG, why are the slippers now turning into Croc designs?! p/s:hi! just found ur blog, will bookmark it! have a nice day! My vote has to be Havaianas….. The most most COMFY flip flops!!! KL doesnt seems to be popular its crazy in Ozzy and SG…. I think I should replicate my comment here and as well as on Tine’s site. Sesame: That good huh? I hope mine lives up to the hype! I’m not sure about your Novo but our Novo here carried a very limited range. lalala: Oh I’ve seen the Grendha. I can’t wear those for some reason – none of the sizes fit! But they are very cute. yarizhan: Hope you enjoy your stay! synical: Yep, which is why I’m giving it a few days to see. irenekay: You’re right about the comfort level. Haven’t really seen havianas around in KL though. I’ve heard lots of good things about them. geekchic: Some cheap stuff can’t be beat! Hello Kitty slippers sound cute! Anne: Hehe… you too have succumbed. I opted for black for practicality. any of the ladies tried Havaianas? I have 3 pairs and I love them to bits. They are much more comfortable & soft than Ipanema (after I tried it). Definitely one of my treasured item when i travel — whether overseas or to the beach!